The international “Astroinformatics 2018” conference will be held in the Studio Villa Bosch, Heidelberg, from September 3–7, 2018. 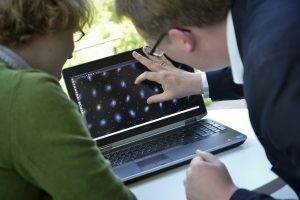 Scientists from all over the world will meet to exchange views on the newest and most successful methods of machine learning in an effort to advance the exploration of the Universe. The conference is organized by HITS researchers Dr. Kai Polsterer, Antonio D´Isanto, Erica Hopkins, and Dr. Nikos Gianniotis (all from the Astroinformatics group) in cooperation with Prof. Joachim Wambsganss (Heidelberg University) and Dr. Coryn Bailer-Jones (Max Planck Institute for Astronomy). The “Astroinformatics” – which is devoted to the scientific exploitation of the fast-growing volumes of data in astronomy – is one of the most important events in this field. At the conference, scientists will discuss topics including novel database systems, visualization and augmented reality, artificial intelligence, and the reproducibility of research results. The conference is hosted at a different location all around the world once every year. This year, it will take place in Germany for the first time. You can find the program and the links to the live-streams online here.